With Midsummer at our door, we have officially entered the time of the Fae. 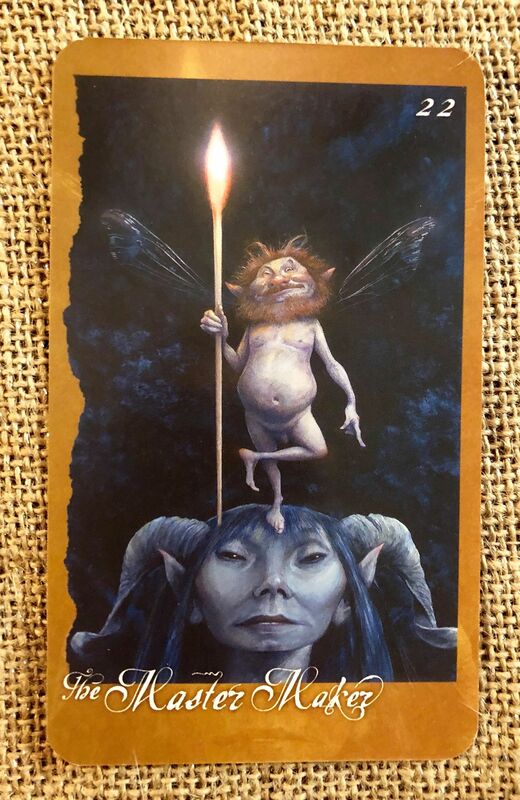 As such, I will be drawing from Froud’s The Faeries Oracle for a few days in their honor (though I might add that some bread, honey, and cream are appreciated as well). May your Midsummer Eve be blessed and fanciful! Meaning: Do whatever you can do as well as you can. And then make it even better. The Master Maker reminds us that our very best work is always desirable, and in the present situation, it is necessary for success. In fact, he asks that we surpass our previous best. Don’t cut corners and don’t take the easy way. Whether making a thing or fulfilling a concept, be sure the design is elegant, pure, and functional, and then follow it, attending to every detail in its turn. He says, “Design behind your skill, and then raise the level of your skill to fulfill it.” Give and accept only the best, and do it with love of your craft, whatever the craft may be. The card speaks of long-lasting achievement, creative problem solving, and confident action. It may suggest cooperation with others, especially from a position of responsibility or of teaching one’s craft to others. Success comes from practical application of traditional principles in life and in work. The Card: The Master Maker is the master of the forge, u pone which we create our future and forge our own souls. He sees the world beyond the Otherworld, the world of first causes. Through his magic, he brings them into his own world of Faery. From his world, these concepts trickle down into our own, through dreams and visions picked up by artists and craftsmen everywhere. But he makes the first, the original. He is the great inventor, and the sign above his door reads: Practical Problems Solved Here. He sings as he works and, as in all faery magic, his song does as much to shape objects as do the the blows of his hammer. Healing cups, magic swords, faery jewels, crowns of Starrs, and other respelled works of the finest craftsmanship pass through his forge and beneath his hammer. The master of fire, air, earth, and water, he adds the faery element of moonlight to everything he creates. He would be the first to tell you that superb craftsmanship, however magical, is hard work – joyful and energizing hard work, but always challenging. As the Master Maker reminds us, “No job is too small to do beautifully.” HIs work is done as well as possible, even where it will never be seen by anyone else. Bringing ideas into excellently crafted reality can only be done when we, like the Master Maker, are willing to plan meticulously, begin carefully, and persevere through difficulties, learning still more of our craft as we work. Craftsmanship is also a labor of love. We must be willing to tackle difficult challenges and have determination to surpass previous achievements. Patience is always required as is the willingness to do a thing again and again until it is even better than the best one can do. The Master Maker has the moral strength to refuse the temptation to do anything less, and he is a protector and teacher of the radiation values of his craft. Yet, in balance to all this, the Master reminds us that we also need to learn our own limits – not everyone can do everything superbly. When we discover our talents and choose our craft, then we gain great joy and fulfillment from developing that skill into an art. We grow more like the Master Maker each time we do the best we can – then stretch ourselves to do a littler better than that.